IT series HDD copystation is specially designed for professional use. It supports high speed duplication up to 90MB/sec based on real test. Three copy modes: quick, all partitions and whole HDD can meet different needs of duplication task. The quick copy mode supports copy only data and system file area can make copying efficient. NTFS, Linux(Ext2/Ext3), FAT/FAT32 sources all can be supported with quick copy mode. The smart easy replaceable SATA interface module can greatly enhance copying efficiency. 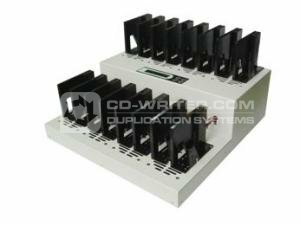 Unlike other traditional HDD duplicators, they need to plug and pull SATA cable to/from each HDD one by one during copying, however IT series duplicator releases such hassle, all you need to do is to plug and pull HDD, no touch of SATA cable. This will greatly enhance the efficiency of duplication. Also, the module SATA interface releases the trouble of change the wearable SATA interface. All the professionals know that the interface module is consumable part, the more duplication, the sooner wear and tear. On IT series, when the SATA interface wear out, all you need is to remove the screw, exchange a new module, it takes only few seconds to finish. Furthermore, besides the high speed duplication, it also support may functions such as DoD erase. ADR . 1-15 . HD . Producer . Hard . Disk . Duplicator .